This website and our social media accounts have been quiet for a while – don’t fear, I have answers! First, we went on a trip to Belize and Guatemala. We had a great time. That was just before January, as soon as Jan 1 hit we started a dry January. More on that later. 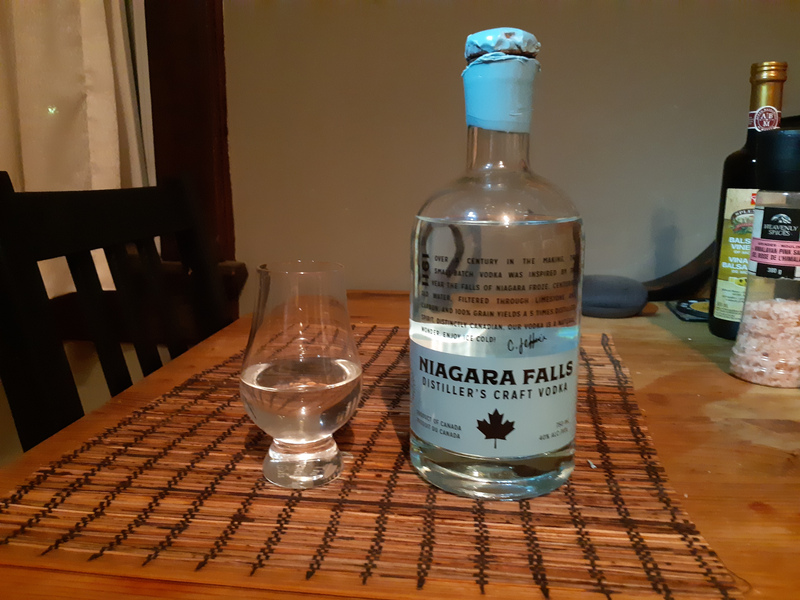 Today though, I am writing about a product I tasted before January and our trip: a craft vodka made by Niagara Falls Craft Distillers. I had not heard of this brand before and when I saw it in the LCBO I decided to give it a try. On the bottle they mention they are the first distillery in Niagara Falls since prohibition which is quite the claim to make and that the vodka is inspired by the great freeze, that time when the falls actually froze over. How a vodka flavour can be inspired by a visual is anyone’s guess. They say the vodka is made with 100% grain but don’t mention what kind of grain it is or where it is sourced from. It is then distilled 5 times (which seems like overkill to me) before making it to your glass. The bottle is pretty inexpensive so I have to keep that in mind as I taste it. Important note: this bottle uses a wax top as you can see in the photo. I absolutely hate when they do that. You aren’t aging this bottle so it offers no real extra protection of any kind – it just gives the “fancy” look. It can be very challenging cutting it off and can even be dangerous if you don’t cut it correctly. You can get a bottle at the LCBO for $27.85 a bottle and it sits at 40% ABV. Appearance: Clear as expected, filtered to hell and back. Not much in terms of legs and they disappear fast. Aroma: Very light, some peaches and bruised apple. Maybe a hint of rye. It’s 100% grain but that could mean anything. Taste: harsh alcohol bite, very sweet apple and hint of cereal. Overall: Not bad but not mind blowing either. Good for the price. Tried it on ice: Way better. Very much wheat focused which I love. Surprisingly more flavour, or more that I can pick up. Some pine and maybe peanuts.